Britain’s Royal Mail will issue a set of Star Wars: The Last Jedi commemorative stamps on October 12. The iconic stamps, first day covers, and related souvenirs can be pre-ordered now. This entry was posted in SF & Fantasy Art, Skiffy and tagged stamps, Star Wars: The Last Jedi by Mike Glyer. Bookmark the permalink. Wait – does this mean K-2SO is in the Last Jedi? 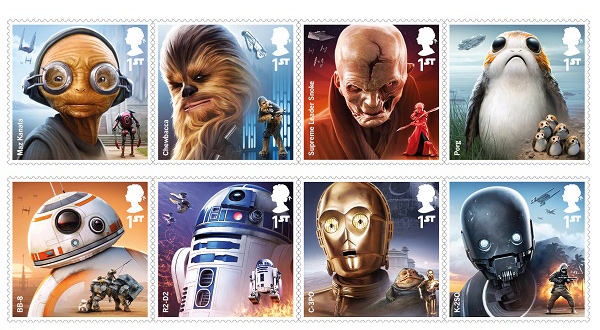 I think they’re meant to be general Star Wars stamps, issued for the next film but not necessarily of the next film. Maybe.